Little Bitts Members Make the News!!! The following is the article about Mike that was published in the New York Times! 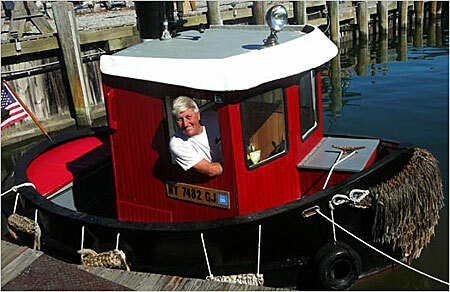 So said Mike Twohig, 75, yesterday as he showed off his miniature tug boat at a marina in Greenport, N.Y., near the tip of Long Island’s North Fork. It looks like something you’d see steaming through New York Harbor 50 years ago, but it’s only 16 feet long and tools around Sterling Basin in Greenport. With its black hull, red cabin and white roof, it looks like Little Toot. It has the classic tugboat shape — wide rounded stern and high muscular pointed bow – and is accessorized with miniature bumpers made of woven rope and a shaggy dressing over the lip of the bow, called a bow puddin’. Mr. Twohig named the boat the “Drummer Hoff,” a character from a children’s book he enjoys reading to his grandchildren. “I can push boats around for friends and stuff, but it’s really just for show,” he said, motoring through the basin on Wednesday. The boat has a quiet four-cylinder, 30 horsepower sailboat engine, and although the hull looks like steel, it is really plywood coated with fiberglass on both sides and painted a glossy black. Mr. Twohig, a retired gym teacher from North Babylon High School, now lives in Greenport. He comes from a long line of Irish sailors and is commodore of the Triangle Yacht Club and has always been handy, but had no boat-building experience. He was standing in the wheelhouse steering the tug with its miniature steering wheel. It even throws a mini-wake behind it, so as to not upset the many moored boats in the harbor. For the exhaust pipe, he used a muffler from an MG-Midget sports car and ran it vertically up the rear of the cabin, protected by a wide plastic plumbing pipe that gives it the look of a real smoke stack. The fixtures are brass and vintage, including working dials, portholes and a real steam whistle that works (He also has a tractor trailer’s air horn for backup).